Most of us see the beginning of the year as a fresh start. Of course, there are many other "do-overs" throughout the year: the start of summer, the end of summer, back to school. There are also those new beginnings where the choices are made for us: a medical diagnosis that prompts lifestyle changes, our company downsizing so that we're forced to look for a new job, a promotion that forces us to work in a new town. I've had my fair share of new beginnings. One of the best moves I've ever made was when I left my accounting job in San Francisco to open the Seven-Year Stitch, my embroidery shop on the Oregon coast. Some of my other "best beginnings" have been finding a new book series. Seriously! Haven't you ever found a book series you simply fell in love with? 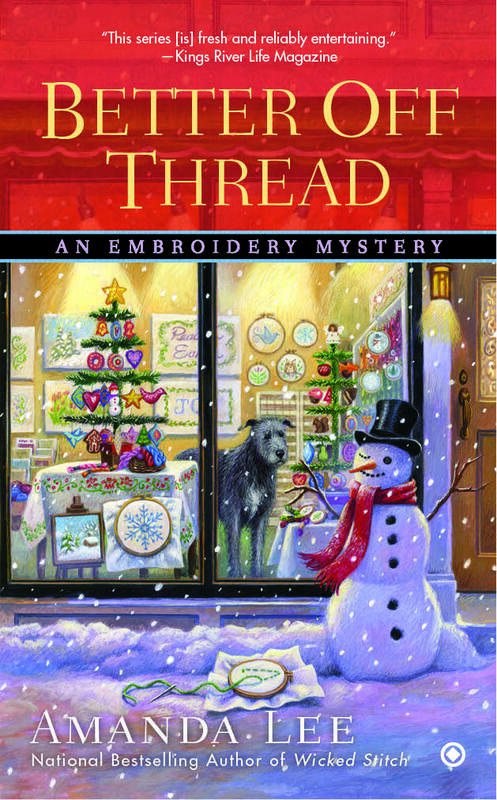 Since my author friends Amanda Lee, Gayle Trent, and Gayle Leeson want to help you discover a new series, they're offering one reader a digital only copy of one of the following books: The Quick and The Thread, Murder Takes the Cake, or The Calamity Cafe. To enter, simply comment below with the book you'd like to read and your email address. Good luck, and Happy 2017!!! Don't forget to enter today's giveaway! Comments will be collected through January 13, and a winner will be randomly chosen and posted in the comments on January 14. The winner will receive his/her choice of book in either Kindle or Nook format.Good luck! Marcy and I wish each and every one of you a blessed 2017. I would like to read a new JD Robb book. New beginnings are always exciting! I read Murder Takes the Cake but not Calamity Café. This one is new to me, and I love the name. thanks for the opportunity. mlarkin at rmrgroup dot com. I would love you read the Calamity Cafe. Thank you for the chance. Too not you. I really hate auto correct sometimes. I would love The Quick and The Thread. annettena at yahoo dot com This is a really nice offer. This is a very nice giveaway. Thank you for this chance to win. I don't really know which book I would like so I am going to chose the Clamity Cafe. I would be thrilled to win The Quick and the Thread! I had no idea it took place in Oregon. I have a soft spot given that I was born and raise there! Thanks for the chance to win! I would love to read The Calamity Cafe. New series are so much fun. Thanks for the giveaway. I would like to read the new Linda Fairstein book coming out in June. I would like to read "Calamity Cafe". Thanks for the chance. would like to read the calamity cafe..thx for chance. Happy New Year! I love finding a new series to fall in love with! I would love to be entered for a copy of The Calamity Café. Thanks so much! I LOVE this series! And I'd love a copy of Better Off thread. I already own all these books. Just wanted to say good luck to all of you. Whichever one you pick, you won't be disappointed. They are all great. 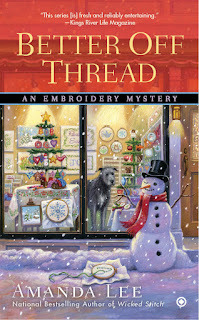 I love the Embroidery series and would love to win a copy of Better off Thread.. Happy New Year to all and thanks for the chance to win! I'd Love Murder Takes the Cake since I read the quick and the thread. I would love to read The Calamity Cafe on Kindle. I've read the others, and they're all good. Thanks for the contest. I am a big fan of Amanda Lee! This book has been highlighted and is at the top of my 'must read' list!